The HG 8x56 with extreme light gathering power, is the ideal companion for observation or hunting in moonlight or in twilight conditions. By using special optical glass from the international glass expert SCHOTT, a newly developed optical system provides for a fascinatingly high level of light transmission which is bound to be highly rated for brightness and contrast. Apart from optics, MINOX has also installed a 'first' with the innovative Quick-Close-Focusing (QCF) makeing it possible to take exact distance readings from a scale on the focusing wheel, a feature often looked for in binoculars. With these exciting features and given quality, the MINOX HG 8x56 is today’s trailblazer that has all the quality and features potential to become tomorrow’s classic in its class. Top quality light transmission is an essential mark of quality in binoculars. MINOX engineers developed the innovative M*-coating of the lenses which consists of up to 21 different layers on the glass surfaces, adapting the various wavelengths of the visible light. This increases the overall light transmission to an impressive 92 percent, while improving brightness, contrast, detail and colour rendering significantly. Another benefit is a completely new optical system designed by our in-house experts with internal anti-reflection and anti-glare coatings to help improve contrast. To provide a reliable and durable protection against internal corrosion and fogging, the binoculars are filled with state-of-the-art Argon gas. Another milestone is the mirroring of the roof prisms through the MinoBright technology. This silver-based coating guarantees an improvement of up to 99.8 percent efficiency of light reflected from the mirror surface. Yet another improvement towards better light transmission within all HG binoculars is the use of lens elements originating from SCHOTT, a multi-national, technology based group developing and manufacturing special glass, specialty materials, components and systems for more than 125 years to improve how people live and work. Better and more advanced handling is achieved through the Quick-Close-Focus (QCF), developed and patented by MINOX. With just one turn of the focusing wheel the HG-binoculars can be adjusted from close-up to infinity. This one turn allows fast focusing close-up, and a more precise focusing for longer distances. With the aid of a scale on the central focusing wheel, the distance to the object in focus is indicated to the user. 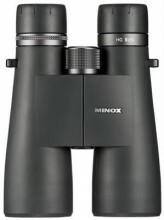 This additional feature makes these HG-binoculars a reliable distance rangefinder. The rotating eye cups for people wearing glasses - found on all MINOX binoculars - can be adjusted in four fixed stops. The MINOX HG 8x56 comes with an exclusive case as well as a neoprene strap. Click the button below to add the MINOX Binoculars HG 8x56 to your wish list.